Chlothar I, also referred to as Clotaire I, (c. 497 – 29 November 561), called the Old (le Vieux), King of the Franks, was one of the four sons of Clovis I of the Merovingian dynasty. 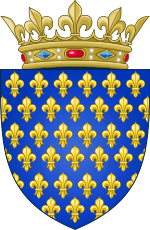 Although his father, Childeric I, had united Francia for the first time, Clovis I divided the kingdom between his four sons. 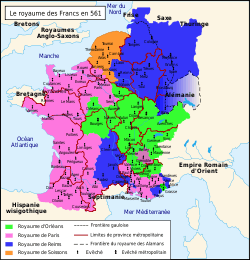 In the year 511 at the age of about 14, Clothar I inherited two large territories on the Western coast of Francia, separated by the lands of his brother Claribert I's kingdom of Paris. Chlothar spent most of his life in an unedifying struggle to expand his territories at the expense of his relatives and neighbouring realms in all directions. Frankish customs of the day allowed for the practice polygamy, especially among royalty. So it was not uncommon for a king to have multiple wives and several competing heirs upon his death. This was a major deviation from the monogamy of late Roman customs, influenced by the Church. 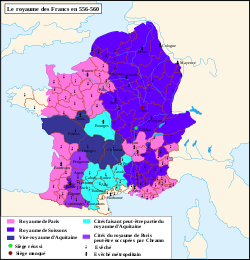 Frankish rulers followed this practice mainly to increase their influence across larger areas of land in the wake of the Roman empire's collapse. The aim was to maintain peace and ensure the preservation of the kingdom by appeasing local leaders. In the Germanic tradition succession fell, not to sons, but to younger brothers, uncles, and cousins. But under Salic law, Clovis I instituted the custom of sons being the primary heirs in all respects. However, it was not a system of primogeniture, with the eldest son receiving the vast majority of an inheritance, rather the inheritance was split evenly between all the sons. 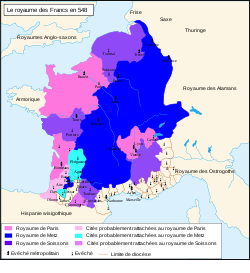 Therefore, the greater Frankish Kingdom was often splintered into smaller sub-kingdoms. Chlothar's wife Ingund requested that he find a husband worthy of her sister, Aregund. Finding noone suitable, Chlothar took Aregund as one of his own wives. The year was c. 533-538. She remained his wife until the death of her sister, Ingund, in 546, after which she fell out of favor with Chlothar. The alliance, along with the aid of his nephew Theudebert I, conquered Thuringia, and it became a part of the Frankish domain. During the division of the spoils, Chlothar and Theuderic argued fiercely over the hand of Princess Radegund, but eventually Chlothar won the dispute on the grounds that it had been his men who had captured the her. 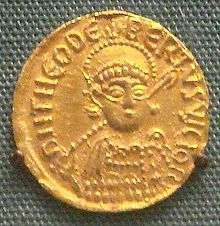 Theudebald, Chlothar's great-nephew and the grandson of the late Theuderic, died childless in 555. So Chlothar immediately went to Metz to take possession of the kingdom from his late nephew, but under Salic Law he had to share it with his brother. So he married Vuldetrade, Theudebald's widow and the daughter of the Lombard king Wacho. This ensured the smooth succession to the kingdom of Great Metz, as well as an alliance with the Lombards, established since the reign of Theudebert. But the bishops condemned this incestuous marriage and forced Chlothar to divorce her. They gave her in marriage to the Bavarian Duke Garibald. 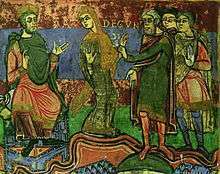 To compensate for the breakdown of the marriage with Vuldetrade (Waldrada), Chlothar gave Chlothsind, his daughter, to the Lombard prince and future king, Alboin. 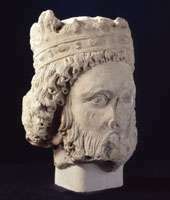 Condat the Domesticus, great administrator of the palace of King Theudebald, retained his position after the annexation of the kingdom of Metz. ↑ Also spelled Chlothachar, Chlotar, Clothar, Clotaire, Chlotochar, or Hlothar, giving rise to the name Lothair. ↑ Jean-Louis Fetjaine, The Purple Queens: The Robes of Fredegonde. Chap 1, Belfond, Paris, 2006, p. 14. ↑ Godefroid Kurth, Clovis, the Founder, Éditions Tallandier, 1896, p.505 ; Patrick Périn, Clovis and the Birth of France, Éditions Denoël, collection « The History of France », 1990, p.117 ; Rouche (1996), p.345 ; Laurent Theis, Clovis, History and Myth, Bruxelles, Éditions Complexe, collection « Le Temps et les hommes », 1996, p.80. ↑ Grégoire de Tours, Histoire, livre III, 6. ↑ Grégoire de Tours, Histoire, livre IV, 3. ↑ Bernard Bachrach, Quelques observations sur la composition et les caractéristiques des armées de Clovis dans Rouche (1997) pp.689-703, p.700, n. 55. ↑ Georges Duby, Le Moyen Âge 987-1460. Histoire de France Hachette, 1987, p.56. ↑ Grégoire de Tours, Histoire, livre III, 18. 1 2 Isidore de Séville, Historia Gothorum. 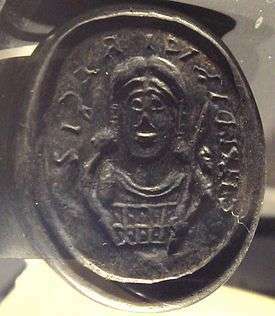 Auctores antiquissimi, t. XI. ↑ Ian Wood, The Merovingian Kingdoms:450-751, (Longman Limited, 1994), 65. 1 2 Rouche (1979), p. 63. ↑ Grégoire de Tours, Histoire, livre IV, 20. ↑ Armand (2008), p. 34. ↑ Ian Wood, The Merovingian Kingdoms:450-751, 137. 1 2 Ian Wood, The Merovingian Kingdoms:450-751, 59. ↑ Ian Wood, The Merovingian Kingdoms:450-751, 60.